Detailed Los Angeles County surf forecast maps and the latest eyeball surf report from local surfers in the region. Near-shore swell is shown on the map together with the surf forecast rating for spots in Los Angeles County. Find the best places to surf in offshore conditions by selecting the wind option on the forecast map. Windsurfers and kite surfers can also use this option to find more favorable cross-shore conditions in Los Angeles County. Our local Wavefinder indicates where some of the best conditions are likely to be found in Los Angeles County over the next 7 days. Surf photos from Los Angeles County and reviews of the best spots and surfing conditions have been provided by local surfers. All map types that you can enable here: Los Angeles County Colour Base Map, Wave Height, Wave Energy, Los Angeles County Swell 1 Energy, Swell 2 Energy, Windwave Energy, Los Angeles County Precipitation, Wind, Temperature, Los Angeles County Cloud Cover. Map overlays available for display: Los Angeles County Pressure, Wind. Symbols shown on the map: Los Angeles County Surf Breaks, Tide Forecasts, Cities, Los Angeles County Ski Resorts, Live Wave Buoys, Live Webcams, Los Angeles County Wind Now, Temperature Now, Weather Now, Los Angeles County Swell at breaks, Rating at breaks. Los Angeles County Surf Forecast map for predicting the best wave and wind conditions across the region. For surfers, the map shows the most powerful swell tracking across near-shore open water and not the peak waves experienced by boats out at sea. Move your mouse over the ocean swell symbols or the surf breaks on the coastline to see a more detailed surf forecast including wave period and wind conditions. The forecast updates every 6 hours and most live weather reports update every hour. You can animate the Los Angeles County Surf map or show live wind and wave conditions as reported from wavebuoys and local weather stations. 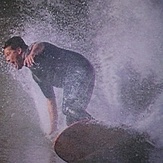 Surf breaks shown along the Los Angeles County coastline are also listed below. Most of coastal Los Angeles County is a curved sandy beach break that is very sensitive to local winds and tides. Most of these beach breaks are combination breaks, in that they are affected by both northern and southerly swell angles. There are river mouths but they are controlled be cement channels and walls of rip rap. Long shore currents also play an important role in the surfability of the beach breaks and can become quite strong in overhead surf. 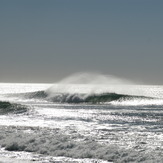 Numerous rip rap jetties provide wind and current barriers and create point breaks along the urban beaches. The Northern portion of the Counties coast is mountainous, this is the Malibu area. Every canyon is a coastal river mouth and from most of these river mouths emerge rocky points. The ocean is glassier here and the waves break slower and more gently. Kelp forests and mountainous wind barriers combine to produce these all day glassy conditions. Wind is often channeled down many of the canyons and can produce offshore and sideshore gusts that sweep across these points even while the urban beach breaks are full onshore and choppy. The NW swell is partially or wholly blocked in the northern counties but when there is a good south west swell all of these breaks really come alive and some days are simply epic. The southern portion of the county is dominated by the rolling hills of the Palos Verdes Penninsula, the winter crown jewel of the South Bay of Los Angeles. These breaks are for NW winter ground swell and can easily tame 20 foot surf. The Palos Verdes breaks are at rocky points and submarine outcrops of the Monterey Shale formation. The cobbles and boulders along these shores are often polished dolostones, shales, green sandstones and volcanics. There is very little sand anywhere on the Palos Verdes Peninsula and the bottom is always rocky. Local knowledge of the tides and swells is critical if you plan to surf here and some of the breaks have a reputation of jealous territorialism by local surfers. Best to surf the area with a knowledgeable guide your first few times and be top of your game before approaching some of these rocky points and reefs. Combination point and reef break. Lefts and rights. Best time of year:May to October. Generally mushy but can get good. Low cliffs and narrow sand beach with a rocky point.